Yarn: Katia Bombay, 1 skein, color 2003, size 7 shoe. Needles: size 4 double points. I like to have 6 needles when making socks. Gauge: 6 stitches per inch. Cast on 48 stitches and join. Knit in the round for ten rounds. Knit two, purl two for ten rounds. Slip all stitches as if to purl. Knit 24 stitches on to one needle to begin heel flap. Purl back. Right side: slip 1, knit 1, 12 times. Wrong side: slip one, knit 23. Repeat these two rows for 2 1/4 inches. End with a wrong side row. Sl 1, knit 13, ssk, k 1, turn. Sl 1, p5, p2tog, p1, turn. Sl1, knit to one st before gap, k2tog, k1, turn. Sl1, purl to 1 st before gap, p2tog, p1, turn. Repeat these two rows until all sts are used. End with purl row, turn. Knit heel stitches. Pick up and knit along selvage (going through both loops) of heel flap. 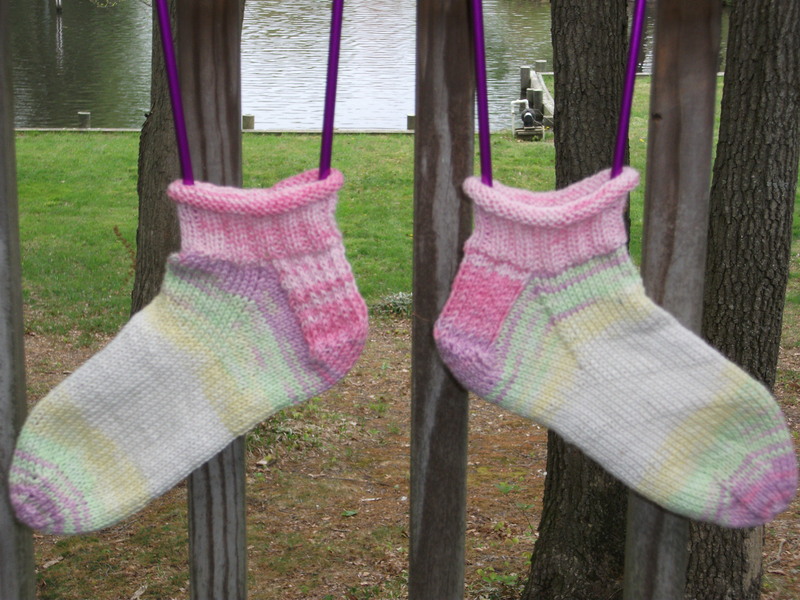 Pick up and knit one more at gap between heel and instep to close it. Knit instep stitches. Pick up and knit at gap. Pick and knit at selvage as before. At this point, I am apt to have 5 needles with stitches and a sixth for working. How anyone can comfortably work on this section of a sock with only 4 needles is beyond me. A tidbit or two. When I work in the round, I will knit one or two more stitches onto the next needle to reduce the ladder effect. As I decrease stitches, I decrease the number of needles I’m working on. Get out your markers. I like coilless safety pins. Knit to 3 stitches before gap stitch. K2tog, k1, place marker. Knit across instep. Place marker, k1, ssk. Knit to end of round. Knit one round. Repeat these rounds until you back to 48 sts. Knit along mindlessly until you are 2″ short of you longest toe. For me, it’s the one next to my big toe. It’s probably why I am happy in ugly shoes. Don’t try to measure your foot and your sock. Put it on and measure what’s sticking out. It works better. And don’t eyeball it! Place a marker at each side to separate the topside from the sole. There should be 24 stitches between each pin. Knit to 4 sts before maker, k2tog, k4, ssk. Knit to 4sts before next marker, k2tog, k4,ssk. Knit to end of round. Knit the next round without decreasing. Repeat these two rounds until a total of 24 sts remain. Work the decrease round on every round until 12 sts remain. Knit to marker. Put sts on 2 needles, one for topside and one for sole, and close with Kitchener stitch. I really hate the Kitchener stitch so I suggest trying Lucy Neatby’s method.